Hey there! I'm all caught up so the rest of the month is scrapping whatever I please. Today is all about Scrap Our Stash. 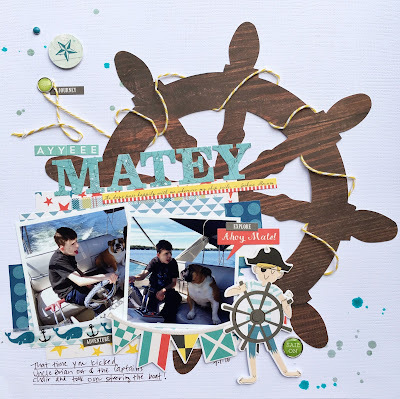 I am sharing pages I made for both July challenges today. This first LO is based on the Stash challenge. Find inspiration from the book "Oh the Places You'll Go" by Dr. Suess, using 5 patterned papers and a circular element. I did this right after we got home from vacation after July 4. It's a Sketch from Paper Issues and wow, it got my mojo going! I don't know where he thought he was going, but he booted his Uncle out of the captains chair and took over the wheel. I'm guessing he was discussing his plans with Hank the Bulldog, but we didn't catch what they were saying. I can tell you that Uncle Brian had to jump back in to steer, because we clearly weren't going where we were supposed to! So yes, Oh the Places You'll Go! There are 5 patterned papers, (wood, plaid, star, triangle, dots) a few round brads and a round sticker. This next page is for the Sketch +3 challenge. I used Simple Stories (game card die cuts), Theresa Collins (my guy and hexagon stickers) and Uniball pen (doodled lines on navy paper and around 'notes' above photo). 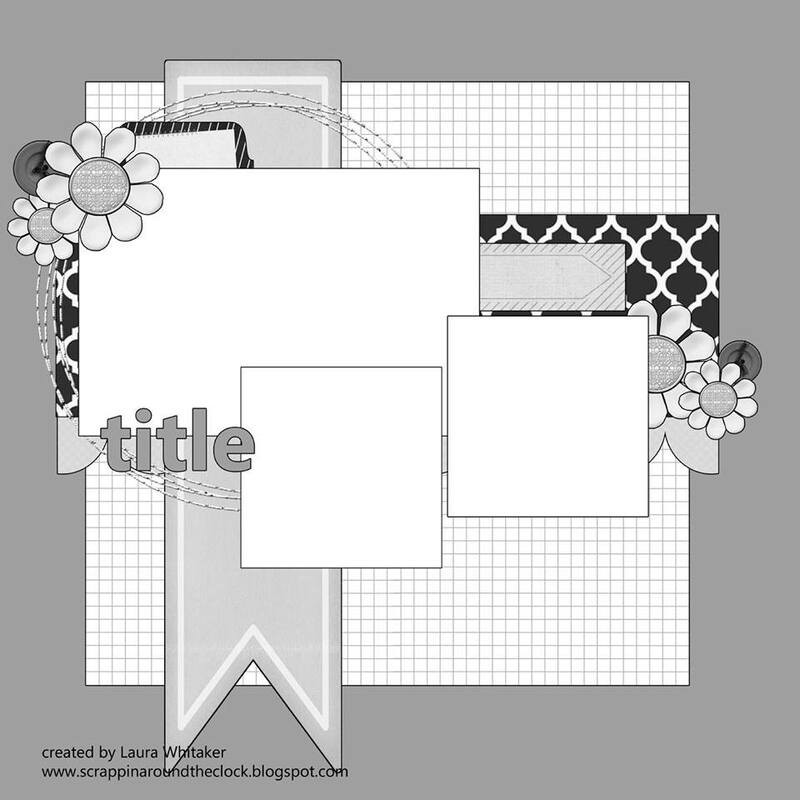 I saw this Preppy Plaid cut file at The Cut Shoppe and loved it. It was perfect tot use as the background for this page. While waiting at the doctors office one day, my son grabbed a coloring sheet and started coloring. I couldn't remember the last time he did that. It just struck me that as fast as he is growing up and becoming more independent, I was so happy to see a part of him that was still a little kid. Good morning! I'll bet you've never thought about using a metaphor as inspiration for a scrapbook page. Well neither had I. Today's article on the Get It Scrapped blog shares several metaphors translated on to the scrapbook page. 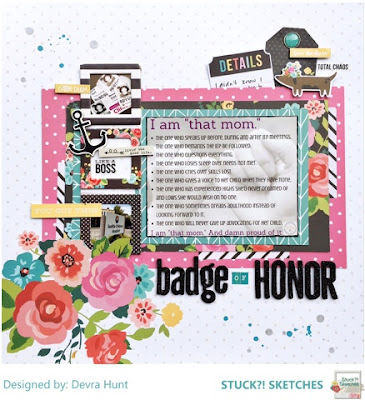 One of my favorite things about Debbie Hodge at Get It Scrapped is her continuous flow of new ideas to keep scrapbooking exciting. Recently, my son had major surgery on both legs. This page shows his recovery progression from learning how to go up the stairs with casts, to walking in the front door the day the casts came off. I felt "As Strong as an Ox" was the most fitting metaphor to describe my son. 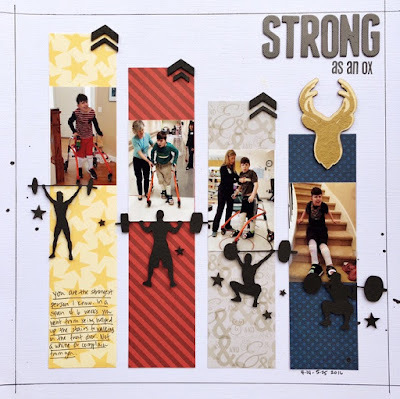 The linear design, primary colors, tonal patterns, the gradual increase in height, and the weight lifters all match the progression of recovery in each photo. All of this speaks to strength, both literally and metaphorically. By using the tonal patterns, I was able to keep the photos visible. As I was searching for ways to embellish, I came across the weightlifting cut files. I couldn't have asked for a better metaphorical choice. They also appear to ground the photos, by lifting them up. The black also gives a nice contrast. Good morning! Today is a great day! It's reveal day at Stuck?! Sketches as well as my younger son's birthday. So, with out further delay, here is the second July sketch. Remember that playing along gives you a chance to win prizes from our sponsors. See the rules for details. Would you look at that. I pretty much followed the sketch! I received a contest prize from American Crafts that included this collection. I don't usually buy fall/Thanksgiving themed papers, so it was a nice change to play with these colors. Challenging, but fun. I used a mix of patterns for balance. 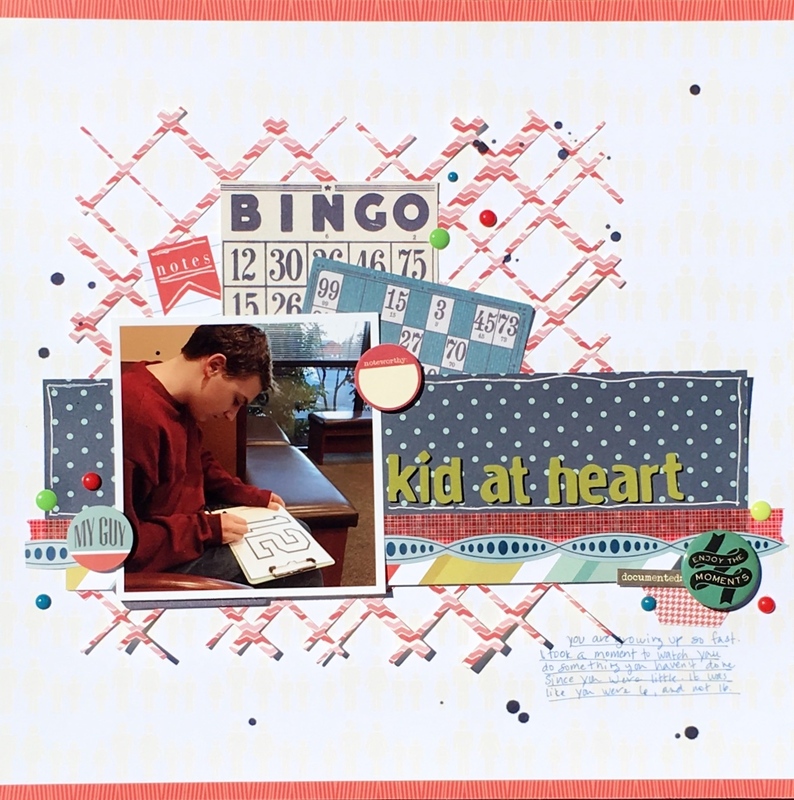 Then I swapped out one of the photos for a journal card and created an embellishment cluster around the title. Im in a stitching phase right now, so of course I had to add some to my page. I make Thanksgiving every year, and have for the past 25 years. It's my thing. I love having people over, and my door is open to anyone who has nowhere to go. But, I also haven't lived near family for the past 25 years, so someone has always come to visit me so I am not 'alone'. This year, I invited some friends over, and at the last minute, my sister came as well. We prepped and cooked for two days, without any arguing and had the most amazing Thanksgiving I can remember. Thanks for taking a look at my creative view today. Come back again soon. I have lots up my sleeve! Hey there and happy July to you. Wow, I can't believe how fast the first half of this year has passed by. 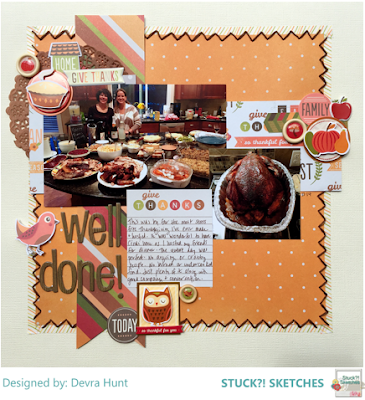 Well, new month, means a new sketch challenge at Stuck?! Sketches. Today we have for you a multi photo sketch. I found this one really fun to use! I finally broke into these papers. I actually chose them before anything else. I don't usually work that way. 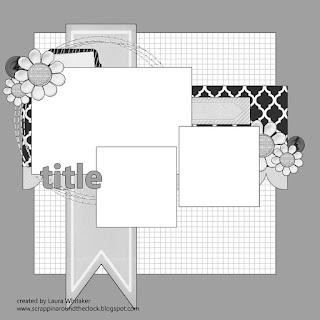 But I wanted to use the frames, and I loved the idea of using the flower cluster on the paper. At the same time, this photo was sitting near the top of the pile. It's personal, It all came together after that. But a story I wanted to tell. The 2 smaller photos go hand in hand with the larger one. 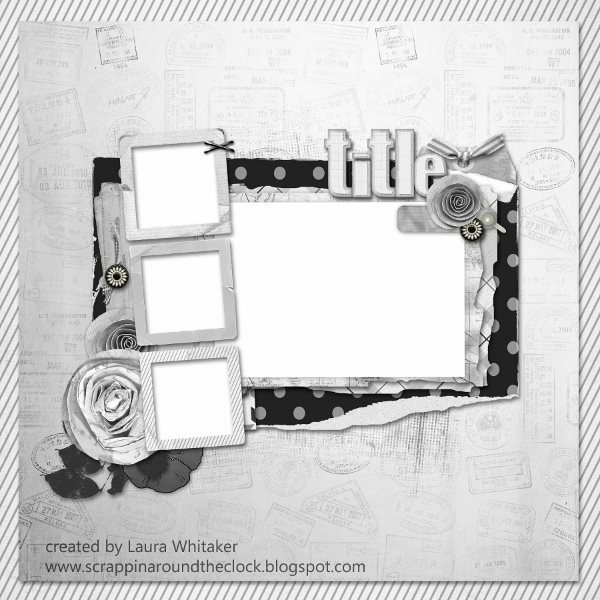 The middle frame is filled with purposeful embellishments and a few of the inspirational word phrase stickers, some in pun. It's a very busy page, so I straightened out the sketch design, moved the title to the bottom, and omitted the additional background paper. As I said above, this page is personal. I found this floating around Facebook one day. I saved it and printed it, not sure of my intention beyond tat. Having a child with special needs I can relate to every single sentence. Sometimes I need to remind myself that it's ok. That I'm ok. So come join the fist July challenge for your chance to win prizes from this months sponsors. Thanks so much for stopping by my creative view today. I've got a good plan this month so come back again soon.